The Hellenic Society of Constantinople will host their 52nd Annual Dinner Dance on February 2nd at St. Sophia Cathedral’s Maniatakos Hall, Los Angeles, where the society will honor a prominent archaeologist, according to greekreporter.com. The annual award is given to a person of Greek descent who excels in their field. A list of past honorees reads like a who’s who and features names such as Clint Eastwood, Jim Gianopulos, Costas Mandylor, Billy Zane and Nia Vardalos. This year’s event will honor Dr. Sharon Gerstel, the Acting Director of the Stavros Niarchos Foundation Center for the Study of Hellenic Culture at UCLA. She is also the Associate Director of the UCLA Center for Medieval and Renaissance Studies. The professor’s work focuses on the intersection of ritual and art in Byzantium and the Latin East. She has published a series of books on various archeological topics, and has won many awards including a prestigious J. Simon Guggenheim Fellowship (2011-2012). Dr. Gerstel’s work as an archaeologist has brought her to excavations in Greece many times, both as a field director as well as a ceramics specialist. The dinner dance will be held on Saturday February 4, 2017 at St. Sophia Cathedral’s Maniatakos Hall with a cocktail hour at 5:30 PM and dinner beginning at 6:30 PM. During the dance, there will be a “Vasilopita Prize” where a real gold, blessed coin will be baked into a vasilopita for the lucky winner who receives it in their slice of sweet bread. The event is open to the public. Tickets are a donation of $125 per person, or $75 for students. All proceeds from the event go to the Philanthropic Institutions of the Ecumenical Patriarchate of Constantinople to promote cultural events, awareness and restoration projects in Eastern Orthodox Churches globally. 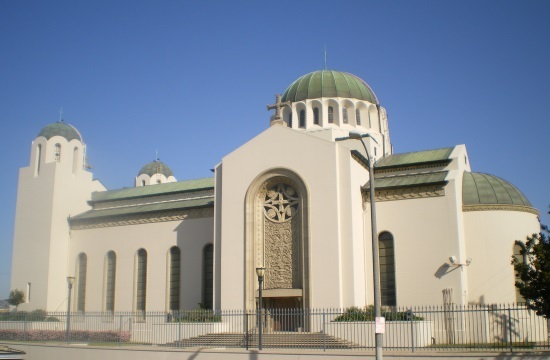 Saint Sophia Cathedral is situated at 1324 S. Normandie Ave, Los Angeles, CA 90006.